Adria Gulizia was an IILJ Scholar from 2010-2013. After receiving her J.D. 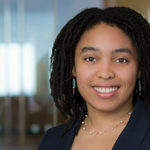 from NYU Law in 2013, she joined Debevoise & Plimpton in the Business Restructuring and Workouts Group, where she assisted in consensual restructurings, collateral management, resolution planning and bankruptcy-related litigation proceedings. She is currently a corporate associate and a member of the firm’s Financial Institutions Group whose practice focuses on banking.